A:A standard size shot glass will fit this box width, however, depending upon the height the lid may not close completely. Q:What is expected to put these together. Do you have to put the Glitter on and also install the ribbon. Or do you just have to fold the box. A:The boxes are shipped flat and will require you to fold the box together. Q:Would a chocolate covered strawberry fit into this box? Q:How many chocolate covered Oreos could fit in these? A:The boxes are too small to fit the chocolate covered Oreos. Q:WHAT COULD i PUT IN THE BOX FOR A WEDDING SHOWER?? wHAT ARE THE DIMENSIONS. i THINK IT MIGHT LOOK CUTE IN FRONT OF EACH PERSONS PLATE AROUND THE TABLE. A:Most people fill the boxes with small candy or snacks. The box is 2.15"L x 2"W x 2.15"H.
Q:How many Hersey kisses can this hold? A:It can hold approximately 10-12 kisses. Q:Is it 24 Glitter favor Boxes per set? or just one box costs 17.75$? A:Each set 1 is for 24 boxes. Q:How many dragees can i put in the box? A:Around 20-22 can fit in the box. The best things in life are glittery! Glitter favor boxes add shine and glamour to any bridal shower or wedding reception theme. 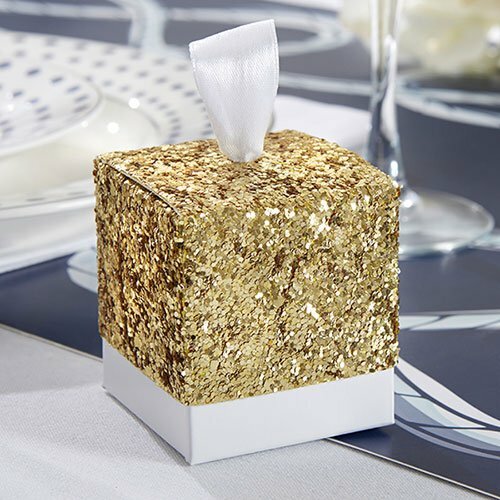 Decked out in gold glitter, these favor boxes are finished off with an elegant white satin ribbon pull tab. Simply fill with fun trinkets or delicious treats and place on tables for an stunning décor item.